Do your agents need a shot in the arm? A refresher on bedrock concepts? A full day of education, motiviation, and high-impact, laser-focused training is exactly what your team needs. Our BootCamps are well-known for being invigorating, information-packed events that give you and your team the boost needed to level-up your business. The Sales Mastery BootCamp is designed to give you the benefits of our two-day bootcamps, but in a compact and cost-effective package that is also closer to home! Over the years, we’ve trained hundreds of agents through our local events, but we know you can’t always come to us so we’re bringing the BootCamp to YOU! Open houses don’t have to be the way they’ve always been. Let’s talk about how to make them more interesting for buyers and more productive for you! Tips & Techniques for more effective open houses that lead to sales and generate leads! You will view lead generation with fresh eyes after we look at innovative ideas for gathering prospects from new lead sources, as well as tools for managing and making the most of leads that are coming in! Taking a script and making it your own is the difference between telemarketing and serving families. Learn how to effectively communicate and still collect the information you need without sounding cold or rehearsed. Be equipped to handle the most common responses and objections faced by REALTORS®, and get in some practice role playing those conversations! We are putting together our 2017 Schedule now! Want to bring the Sales Mastery BootCamp to your area? Let us know below! 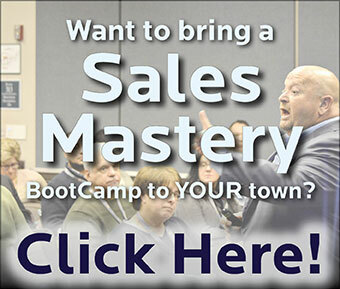 Bring a Sales Mastery BootCamp to Your Town! Questions About the Sales Mastery BootCamp? Would you prefer us to call you back? Please leave us your number.